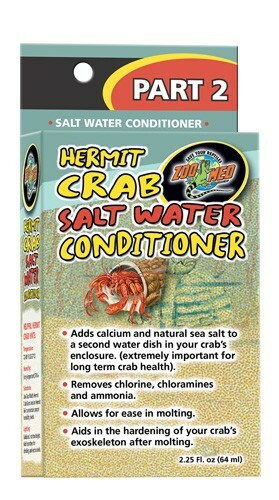 Hermit Crab Salt Water Conditioner | Zoo Med Laboratories, Inc.
Hermit Crabs will benefit from a dish of salt water in addition to their fresh water supply. This conditioner adds natural sea salt as well as calcium in addition to removing chlorine and chloramines. Use in conjunction with Zoo Med’s Hermit Crab Drinking Water Conditioner (Part 1) for optimum health and longevity of your Hermit Crabs. Add 1 teaspoonful per 250 mL (1 cup) of water. Measure amount of water in your crab’s water dish and adjust dosage/amount accordingly. Use every time water is changed. Water, natural sea salt, ClorAm-X®, buffers, synthetic organic polymers, and FDC yellow#5.